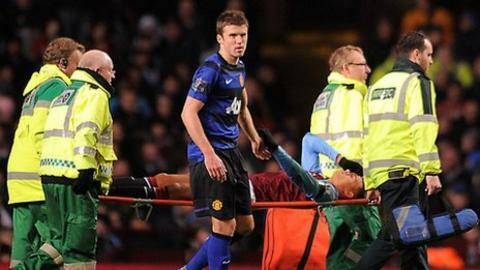 Aston Villa's on-loan midfielder Jermaine Jenas has been ruled out for six months after undergoing surgery on an Achilles injury. Jenas, who is on a season-long loan from Tottenham, was stretchered off during Saturday's loss to Manchester United after he pulled up sharply. The 28-year-old underwent surgery on his left Achilles tendon on Wednesday. Villa manager Alex McLeish said: "This is tragic for Jermaine and we are all deeply disappointed for him." McLeish added: "To lose a player of his talent and experience is bad enough, but never to have seen him play enough in the Villa shirt for our fans to appreciate the player he is, that's terrible bad luck." Born Nottingham, 18 February 1983. Began club career for Nottingham Forest in 2001 and goes on to make 33 appearances for the club. Sold to Newcastle for £5m in 2002. Scores 12 goals in 152 games for the club. Makes England debut in February 2003. Has previously played for country at all levels from under-15 upwards. Bought by Tottenham in August 2005 for £7m. Extends contract twice, the latter tying him to club until 2013. Joins Aston Villa on season-long loan on 31 August. Jenas said on Twitter: "Back home after the surgery today. "All went as well as it can, thank you all so much for the kind messages. They mean a lot to me!" The midfielder has been dogged by injuries since he joined the Midlands club. Earlier Achilles and calf problems meant that Jenas did not make his debut for Villa until 5 November, when he came on as a second-half substitute against Norwich. Since then, he has made one more substitute appearance - against Swansea - and Saturday's game was his first start for the club. The Nottingham-born player has made 21 appearances for England. McLeish indicated after Saturday's game that he would be looking to strengthen his squad in January due to his growing injury list. First-choice goalkeeper Shay Given was also taken off during Saturday's game and will miss the next month with a hamstring injury.